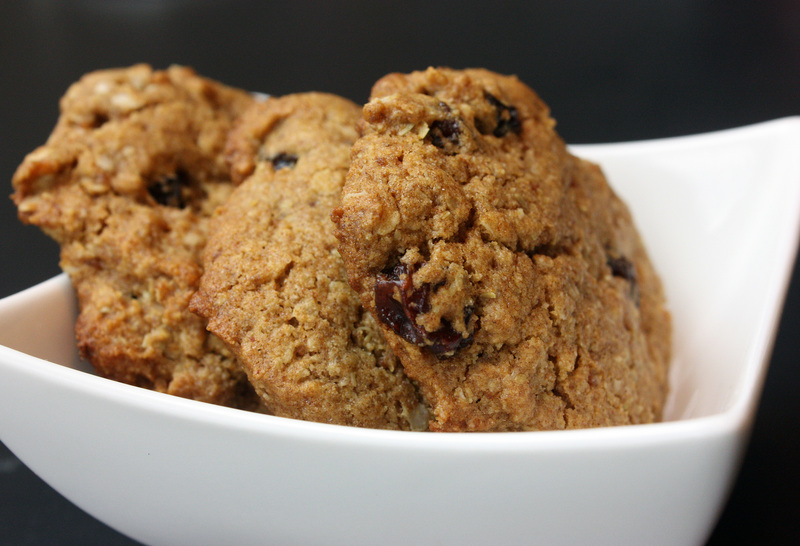 Many, many of the recipes on this blog aren’t simple. I know that. It might lead one to believe that I endlessly slave in the kitchen, making intricate things with lots of ingredients, every night of the week. Truth is, while I’d love to spend all day in the kitchen, reality (a.k.a. chores, errands, projects, a full-time job, step-kids, or otherwise life) gets in the way. (It’s just that when I do spend all day in the kitchen, and something comes out well, I want to share it with you!) So on those hectic days, when I’ve just stepped in the door after commuting for over an hour from the office, I rely on fresh ingredients, prepared as simply as possible, to provide us a nutritious meal (and keep my sanity in check). Many times, this means some sort of quick-cooking protein such as chicken, fish, or the occasional steak (or even leftover protein from the day before, if I’ve planned well), and a variety of vegetables, such as baked sweet potatoes, broccoli, cauliflower, green beans, a tossed salad, or sauteed greens, such as collards, kale, or swiss chard. 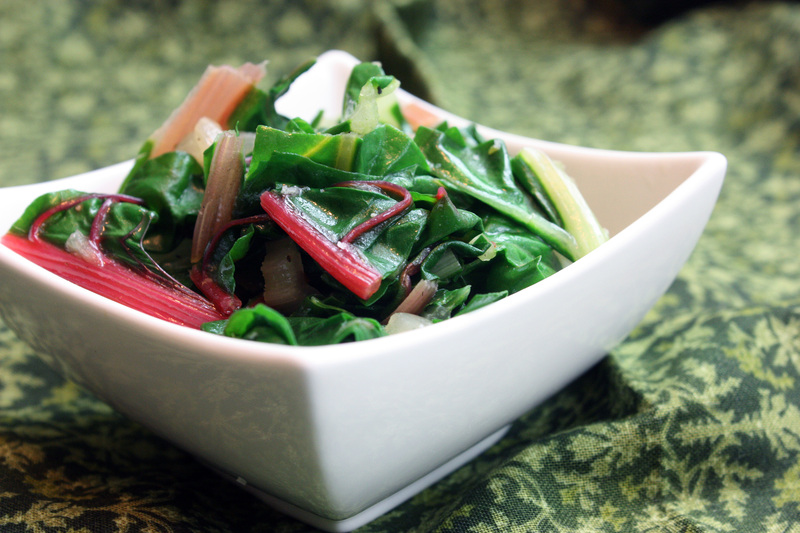 Swiss chard has to be one of my favorite greens. That’s saying a lot, since I love greens of just about every kind, and eat them nearly every day. To me, swiss chard is slightly sweet, and doesn’t need much adornment, particularly when it’s at the peak of freshness. This particular chard in the photo was as fresh as one can get – I picked it from my garden. I’d never planted chard before, so I was excited to watch it grow and flourish (I’m pretty much a novice gardener). There’s something about eating something you’ve grown yourself. It nearly always tastes better, simply because of its freshness. But there’s more to it than that. It’s as if it deserves much more respect, care, and love than any “other” vegetable. It’s almost like it’s your “baby”, if that makes sense. While I’m still learning a lot about how to grow vegetables, I love the experience, from preparing the soil, to planting the seeds, to caring for them until it’s time to harvest and enjoy. It connects me to the Earth, to the seasons, to nature. I feel balanced and at peace. But you came to read about swiss chard. So here you go. Like the title suggests, this is a simple, easy recipe, and I enjoy chard and other greens in much the same manner several times a week. 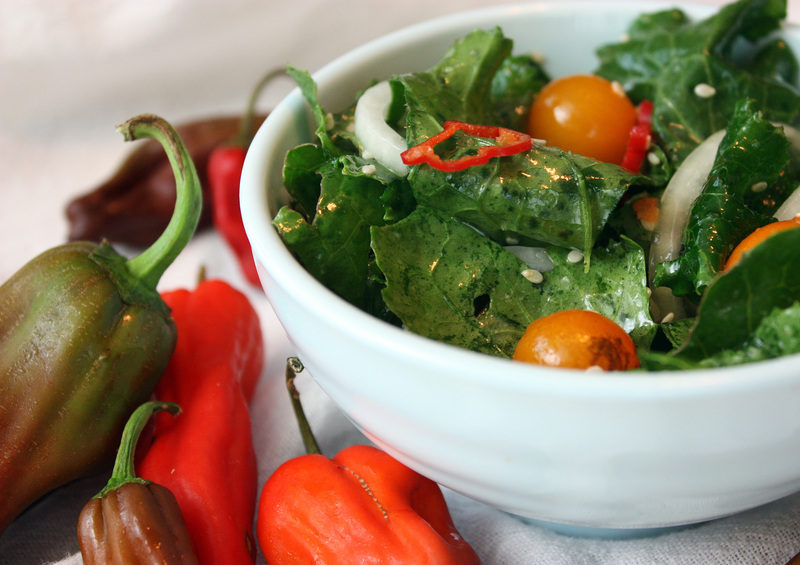 A bit of onion, garlic, and crushed red pepper, and your greens are ready for your enjoyment as a delicious, simple side. 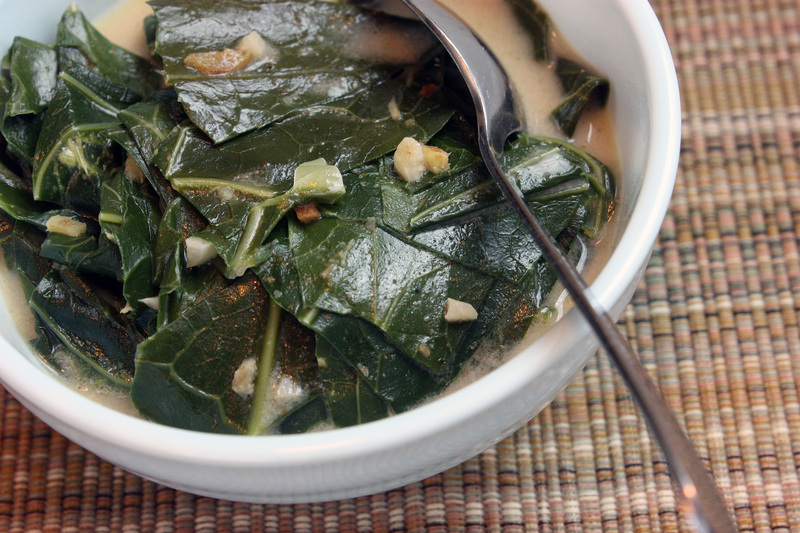 Feel free to use other greens in this recipe as well – collards substitute well here. In a large saucepan, heat oil over medium heat. Add onion and saute for 4-5 minutes or until softened. Add garlic and saute for another minute. Add swiss chard and crushed red pepper and saute for another minute. Add water and cover pan, and allow to “steam” for another 2-3 minutes, or until swiss chard is wilted and the leaves are bright green. Remove the lid and season to taste with salt. So what goes better with Red Beans and Rice (https://tastyeatsathome.wordpress.com/2009/01/05/red-beans-and-rice/) than a big ol’ mess of greens? Now, I didn’t grow up eating collard greens. My parents are not from the South, so it wasn’t a “natural” thing. However, growing up in Texas, I was bound to discover some “Southern” foods sooner or later. Greens was one such food. I first tried collard greens as an adult. First of all, I love just about any green vegetable, and this was no exception. And when you add ham to a vegetable, how could it possibly taste bad? (That’s my opinion, anyway.) This recipe is good with any ham, smoked ham hock, smoked turkey wings, or other even bacon, so feel free to substitute. Add more ham, if desired. It will make the greens even more smoky in flavor, which in my opinion, is a good thing. When serving, it’s always tasty to offer some Tabasco or Louisiana Hot Sauce. In a large pot, bring bacon grease or vegetable oil to medium heat. Add onion, green pepper, thyme, garlic, and ham, sauté for 2-3 minutes. Add salt, pepper, and water. Bring to a boil, and reduce to medium-low. Cook for 1 hour. Wash collard greens thoroughly. Remove the thick stems that run down the middle, and chop greens. Place greens in pot and bring to a boil. Reduce to medium-low. Cook for 45-60 minutes, or until tender. Taste and adjust seasoning as necessary.